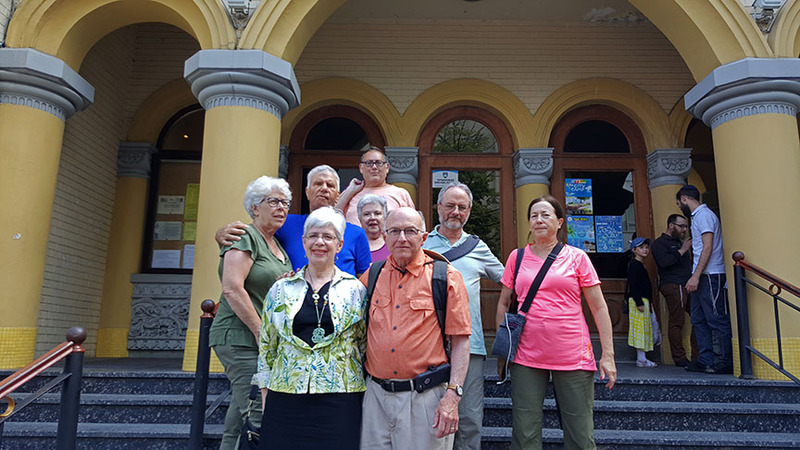 report of 2018 Schleppers club trip to Ukraine. It is a part of a one-month Eastern European trip. Other countries we visited this summer are Poland and Romania. Some of the group members had traveled with me previously and enjoyed our intimate, like-minded group and in-depth experience-focused travel. They encouraged me to form a kind of “Facebook-based travel club,” so they could easily find out about future trips and share their experiences together online. So Schleppers Club was born. Today we have over 100+ members online. For anyone interested, here is Schleppers Club where request can be sent to join. This was the 3rd official Schleppers Club trip. Previous trips were to Baltics and Georgia/Armenia. 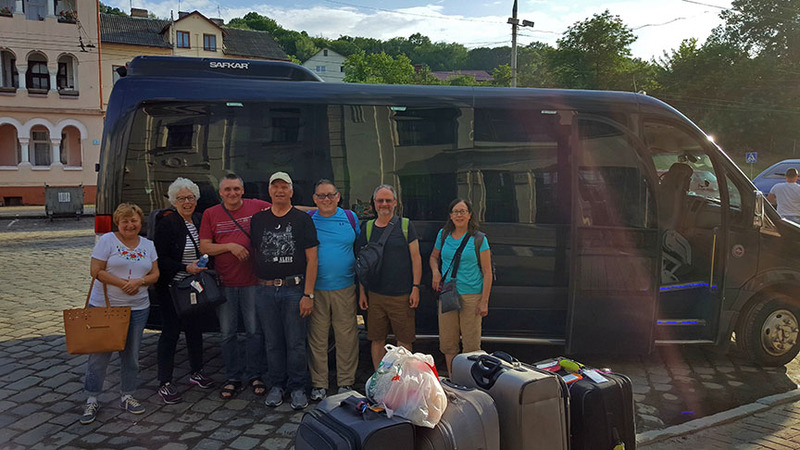 June 5, we arrived Lviv, Ukraine from Warsaw. 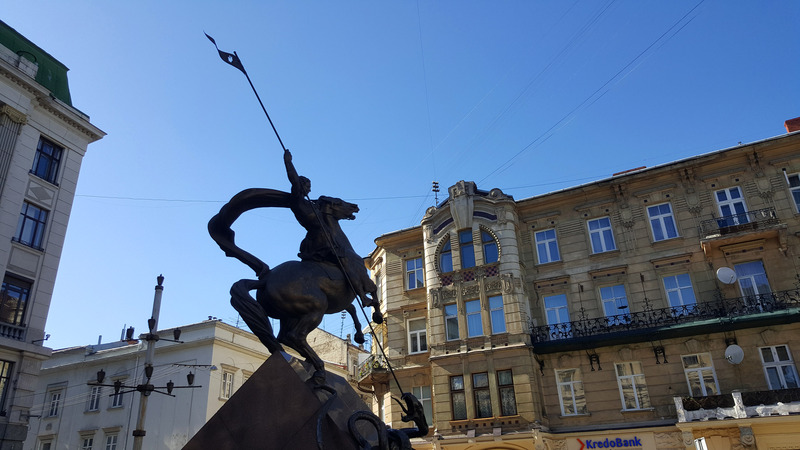 Lviv (was also called Lvov, Lemberg), founded in the 13th century, traces of its Polish and Austro-Hungarian heritage are evident in its architecture, which blends Central and Eastern European styles with those of Italy and Germany. Its ornate buildings and bustling street cafes are reminiscent of Vienna or Prague. Hotel Astoria 4* is in the center of Lviv near Opera theater, a beautiful building circa 1900 built by Polish architect Zigmunt Gorgolewski. Jewish history of Lviv dates to 13c, Jews settled from the beginning, arriving from Turkey and Byzantium. Until the early 20th century, a variety of ethnic groups including Poles, Ukrainians, Jews, and Germans lived side-by-side with relative ease. The city was also taken over by Russians briefly, and after WWI became Poland. When the Soviet Union annexed this region in 1939, it deported hundreds of thousands of Jews and Poles east as part of its state-sponsored terror, which also targeted the local Ukrainian intelligentsia. In 1941, Nazis came in. During the Holocaust, majority of Jews were killed in ghetto or transported to Auschwitz or local Janowska concentration camp. Only about 1000 survived the war but they had to live under Soviet government sponsored antisemitism. wall. It bears a plaque written in English, Hebrew and Ukrainian. I arranged to spend this afternoon with volunteers from local Jewish community Charitable Organization Hessed Arieh and Lviv Volunteer center. Some of the projects recently conducted are construction and refurbishing of former Chassidic Jakob Glanzer synagogue circa 19c built in Baroque style. It was financed by Lviv merchant Jakob Glanzer; hence the synagogue is named in his honor. In 19c it was second largest synagogue. It survived WWII but after that Soviets used it as a gym but was neglected. One of the volunteers I got to know, Sasha Nazar and his team are hoping to restore it and use as a museum and cultural center. We walked to the synagogue with Ari, one of the volunteers, to see the progress of the restoration. Ari is a young man who was born in Odessa, emigrated to Israel as a child and few years ago he came to Lviv and stayed. Being non-religious, but he got involved in local Jewish community. He feels there is much enthusiasm in Lviv and it is exciting time to be there. 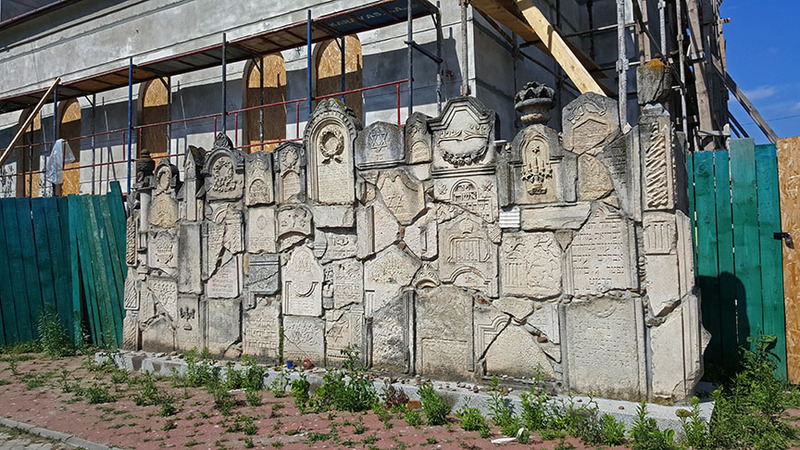 We walked through Jewish quarter and Ari pointed some sites related to the Jewish history, the remnants of former Jewish life and monuments to former synagogues, memorial plaques on the building. Ari’s girlfriend joined us for dinner and we had varenikes at small restaurant Baluvana Galya. The food was delicious and inexpensive. The weather did not cooperate, but we had a good first day in Lviv. In the morning we visited Jewish exhibit in ethnographic museum. Museum is in a beautiful building on former Galician Bank. We did some shopping on the market with obligatory t-shirts and souvenirs. Lviv is famous with its coffee cafés called “Kawiarnja” so we tried coffee and I had melted liquid chocolate. It was sinfully rich and delicious. We saw Lviv Old town, designated UNESCO Heritage site, with beautiful Baroque and Art Deco buildings. 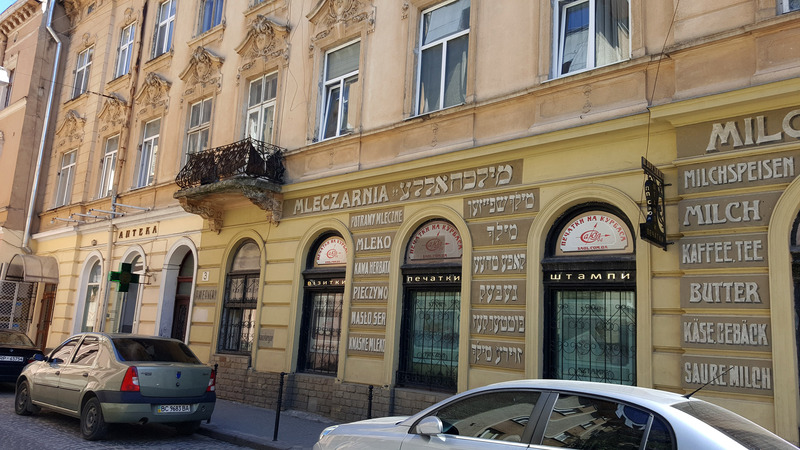 Some buildings in Jewish quarter had restored Jewish inscriptions of former stores on its walls. 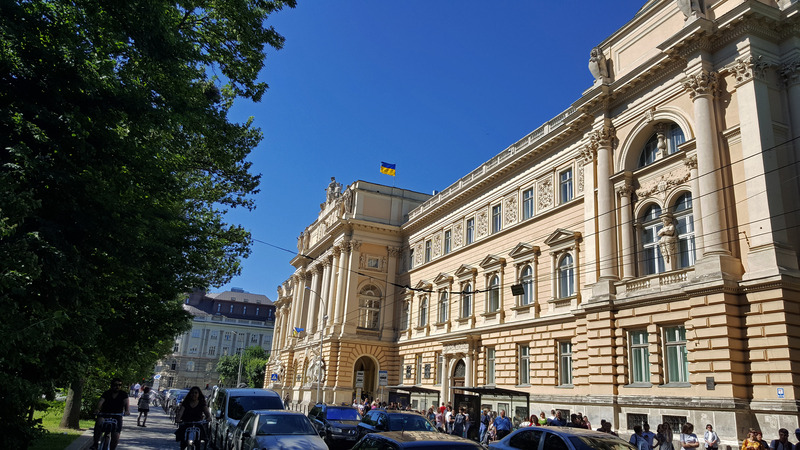 We saw beautiful building of Lviv University. 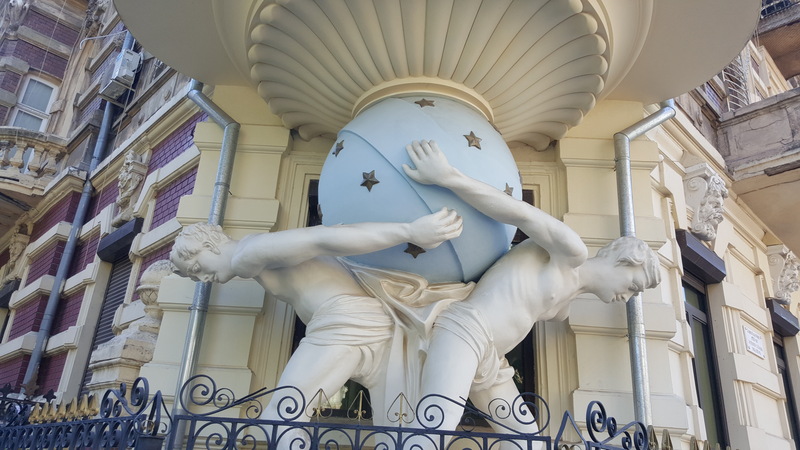 We got inside tour of the most amazing, neo Baroque monument - the House of Scientists. It was richly decorated with stucco of building façade, but inside all was carved from wood. The construction was ordered by the studs’ owners club and was carried out by the famous Austrian company Fellner and Helmer, in 1898. They are known for designing such famous buildings like Vienna Observatory and Odessa Opera. We went to Zhokva about 30 km from Lviv. This small town boasts medieval fortress and palace. Archeologists state this site as settlement back to 2rd or 3rd century bc. 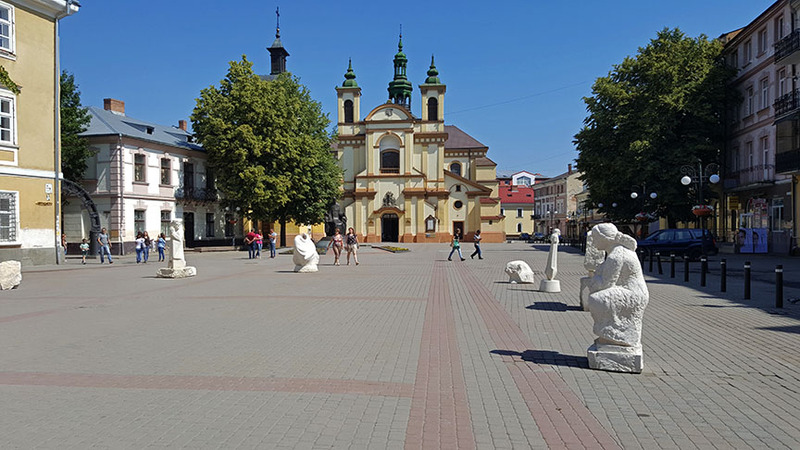 Officially the town was established in 1597 and named Zhovkva in honor of its owner, the Polish field hetman Stanislaw Zolkiewski. It was a residence of King Jan III Sobieski, count Mihail Radziwil – state and military figure of the Grand Duchy of Lithuania. In 18c, the Italian architect Antonio Kastell expanded the palace from the stronghold, decorating the portico and the staircase with the sculptures of Lithuanian and Polish crown hetmans. In 1809 a ball was held in honor of Napoleon Bonaparte. Under Soviet rule Zhovkva was called Nesterov in 1951–1992 in honor of Russian pilot P. Nesterov and went into some neglect and disrepair.Zhovkva’s architectural monuments include the large, well-preserved castle which is undergoing restoration now, a church and monastery of the Dominican order from the 17th century, a synagogue, the remnants of the brick defensive walls and two city gates, and the old market square with some original buildings. We visited castle, enjoyed a walk in the main square to the market where we saw Zhovkva Synagogue. It was built in the 1690s for a rapidly growing Jewish community. During the eighteenth century, it became an important center of Jewish study and worship. An outstanding example of a fortress synagogue, it was designed to protect Jews from invasions. The building has Renaissance and Baroque architecture. 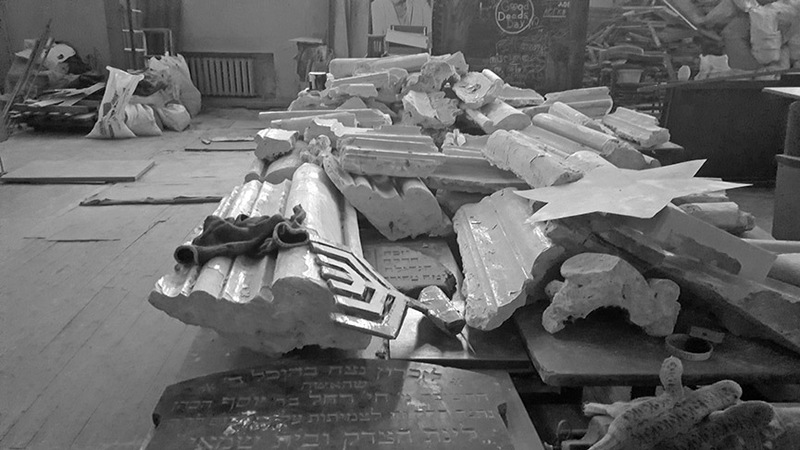 During World War II, Nazis detonated explosives in the synagogue; while most of the interior and roof was destroyed, the outer walls and much of the baroque ornamental details survived. Most of Zhovkva’s Jewish population was killed during the war. 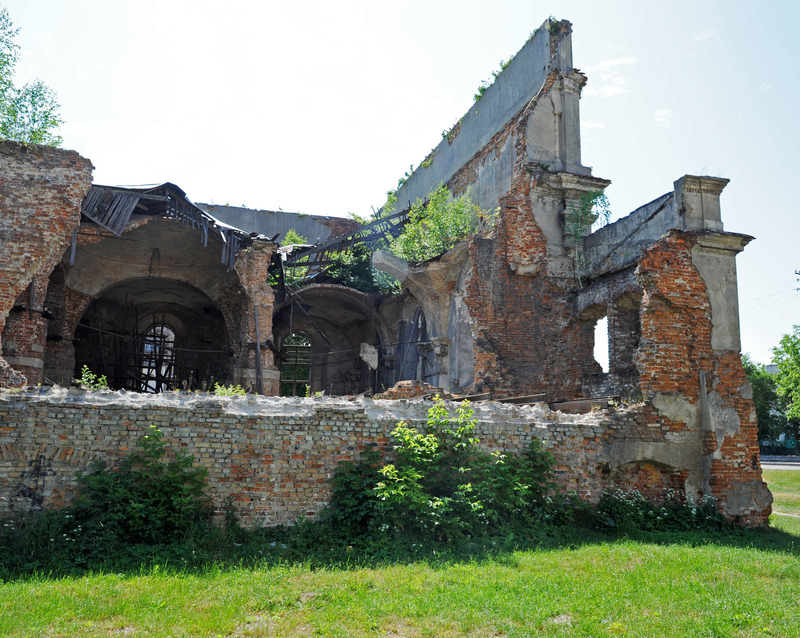 After the war, Soviets used it a storehouse and condition deteriorated. 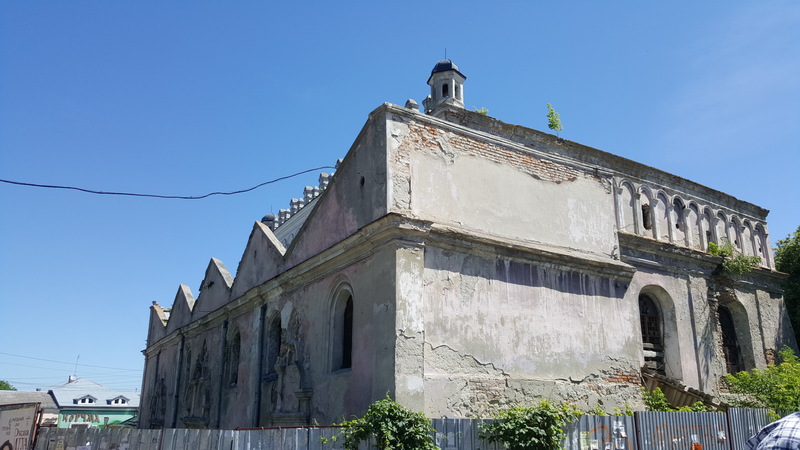 Zhovkva Synagogue is included in the 2000 World Monuments Watch which hopefully will assure that the synagogue and its history will be remembered as an important part of the community’s legacy. We returned to Lviv, had another walk in Old town through Jewish quarter, visited interesting Armenian quarter. Armenians lived in Lviv since 13c when they escaped Mongol-Tatars invasion. Like Jews, they excelled in trading and established successful community. We saw an interesting courtyard with an Armenian Church. In the evening we attended performance of Jewish Klezmers choirs and orchestras from Europe who participated in Lviv 2018 Klezmer festival. It was uplifting to see Jewish culture reborn after Holocaust and Soviet oppression. We enjoyed it tremendously. 2 people from my group departed on their own Heritage search to Drohobytch and the rest of us went to Brody. First, we stopped in Busk, it was a small shtetl. 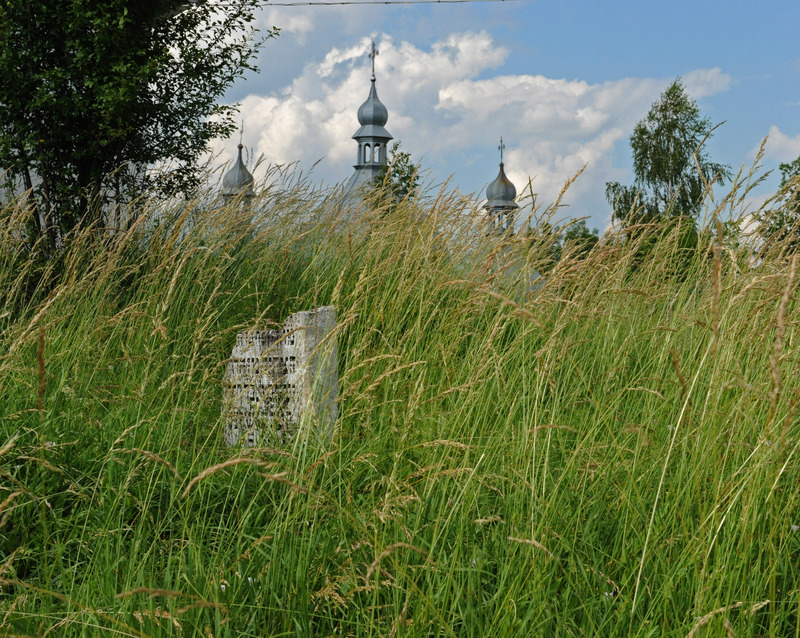 In idyllic countryside, there was abandoned ancient cemetery. Only some tombstones were well preserved, the rest broken and the cemetery is overgrown. soon after was almost entirely inhabited by the Jews. In the 19c it was the second largest city on the territory of Galicia after Lemberg (Lviv) and was important center for Jewish trade and artisans.Besides its commercial importance, the city was of a great Talmudic and scholarly importance. In about 1720 it was a home to the founder of Hasidism Baal Shem Tov. We stopped in Zolochiv (Zlochew), with former Jewish cemetery destroyed during Holocaust. Now it is just one Maltseva and a monument to Zolochiv Jews perished in Holocaust. We continued to Rohatyn where cemetery now it is in better shape thanks to Rohatyn Jewish Heritage foundation led by a volunteer-led program of heritage preservation and education and spearheaded by Marla and Jay Osborn, an American couple who now live in Lviv and work on recovery of Jewish headstones. We visited some Rohatyn memorials and cemetery. We continued to Ivan Frankivsk and arrived in the evening. We arrived Ivano Frankivsk and checked into hotel Stanislaviv. It was best available 3* hotel, very basic. There is another small Jewish hotel “Under Temple” by synagogue but it was fully booked. Ivano Frankivsk did not catch up on hotel scene yet so be prepared. We successfully negotiated with front desk air-conditioned rooms (for some reason, higher room category which we booked, did not have a/c), even it caused downgrade. Dinner was at restaurant Churchill. We were the only ones there and one waiter serving us was not very friendly but attentive. Food was good. In the morning, we explored Ivano Frankivsk. It is a gateway to Carpathian Mountains. It was founded by count Potocki in 17c and was named Stanislaviv (our hotel is called after him). It was defense point against Tatars by Polish Galician Nobles. It became a part of Hapsburg Empire in 18c and in 1918 became briefly independent Ukraine. Then it became part of Soviet Union and was renamed as Ivano Frankivsk after Ukrainian writer Ivan Franko. The city is rather charming, with typical small European city layout – main market square and the Town Hall there, built in modernist style. The main pedestrian street was very pleasant, with many people strolling on Saturday morning, and there were many nice wrought iron sculptures. I think it is not necessarily to spend here more than one night but it is a pleasant overnight. We also met local Rabbi Moshe Kolesnik at the synagogue. There is a small hotel Under the Temple near synagogue and Tsimes restaurant. 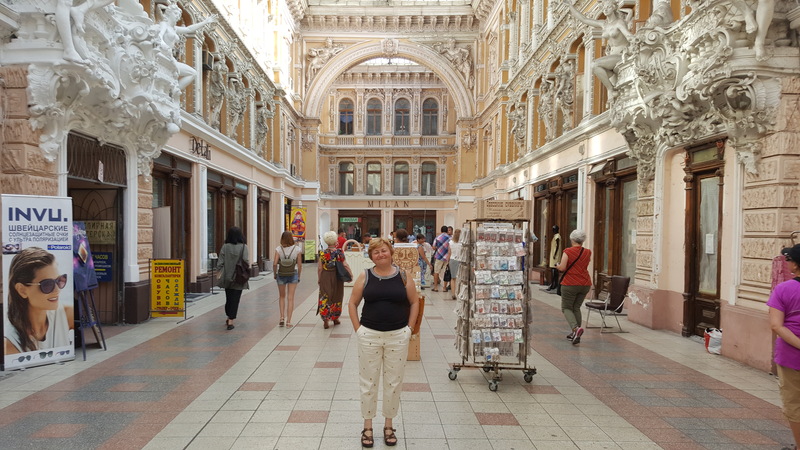 We shopped in the arcade near Town Hall and afterwards left for Kolomya. Kolomya is at the border of Galician and Bykovina. It used to be multicultural city with large Jewish population. We have roots in Kolomya, so we decided to explore it and see some addresses specified at Michael’s ancestors birth certificate. Therefore, we decided to split from the group after lunch and reconnect in Chernivtsi. Kolomya’s Jewish population was 50% from 19c until Holocaust. The rest are Ukrainians, Polish and local indigenous people called Hutsuls. They are highlanders living in the mountains with their own traditions which is reflected in their clothes and music. The museum collection had about 50 thousand exhibits which represent all kinds of Hutsul and Pokuttya traditional folk art, beginning from the XVII century until the present moment. 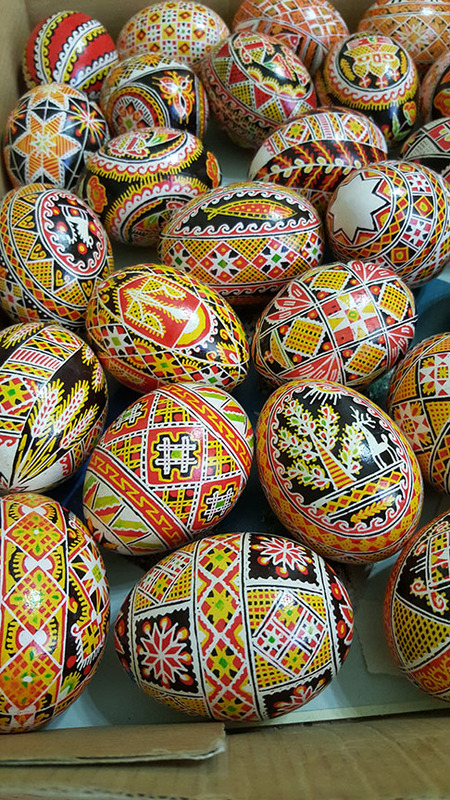 Afterwards we went to museum with painted eggs “Pysanka”. After lunch we met our driver for a day and we visited Jewish community and synagogue and talked to local president of Jewish community. He told us where to find our address and addressed current situation and concern about growing antisemitism. That’s was different from what we’ve seen in Lviv. The attackers painted swastikas on synagogue. Police is parked nearby and watching it but somehow there some incidents are still happening. We found our address Hospital street. We were not sure if ancestor lived on this street or was born at hospital. Older lady was watching up from the balcony and came down and provided helpful information. She said it was hospital here. That was still very touching to stand in the place where our ancestors lived more than 100 years ago. 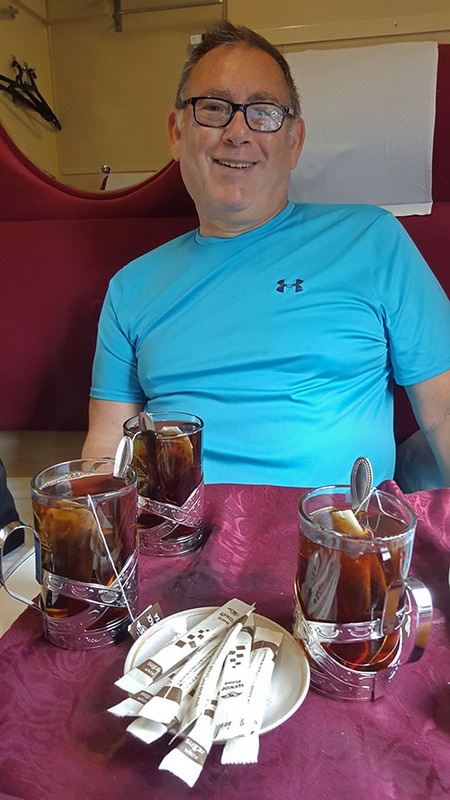 We continued with our driver Yasha to Chernivtsi, on the road stopping at Yasha’s favorite places in the mountains and visited his friends who owns campsite at beautiful waterfall and river location. We helped ourselves with juicy cherries from the trees and walked to see another waterfall bridge and then continued a road to Chernivtsi. We opted for a slower road to see Sub Carpathians. Besides beautiful scenery, we also saw small towns where and places connected with the life and activity of Ba’al Shem Tov and Bykovynian local Hassidic dynasties – Kosov, Vyzhnitsya). But only traces were found of former Jewish life. In the evening we arrived at Chernivtsi and checked into hotel Bykovina. It was a former soviet Intourist typical Soviet hotel at outskirts of the center. Restaurant was good though. In any case we were too tired to go anywhere so we just went to rest after such long and eventful day. We’ve met our guide Zoya and started our tour of the city. Zoya was very knowledgeable and had a wealth of information on complicated history of this town. Just over six centuries old, Chernivtsi was once the chief city of Bukovyna (Beech Tree Land) in old Moldavia (now Moldova). It belonged to the Habsburg Empire in the 19th century, when much of the city's ornate architecture was built, and after WWI was temporarily drawn into Romania. In 20th century Chernivtsi Wbelonged to Romania, USSR and, since 1991, independent Ukraine. The city was always very multinational. Groups of Jews, Ukrainians, Romanians, Germans, Poles, Roma, etc. mixed here. 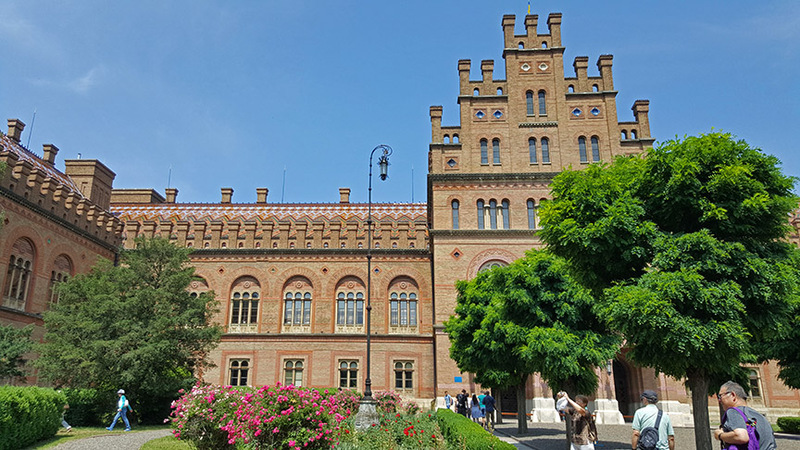 We visited Chernivtsi University, the important monument of national significance and UNESCO Heritage site. It was built in the second half of the 19c according to the design of the Austrian architect Joseph Hlavka as the former residence of the Orthodox Metropolitans of Bukovyna built in 1864-1882. The building resembles Medieval Castle and a fine example of Romanesque and Byzantine architecture. There was the Turkish community living in the 17th century. Near the old wooden well Turks built stone fountain. Since ancient times, there was a city room, which operated till Soviet times. Also, part of the square is a Turkish bridge built in 19th century. After lunch at excellent new restaurant Roza Shteynberg – Jewish (but not kosher) cuisine, we continued to see many Jewish sites and the architectural and historic legacy of a numerous Jewish community that lived in the city during the 19-20c. In 1930 Jews were 27% of the population, today it's 1.2%. During World War II, Chernivtsi was captured by both sides. During the rule of Romanian military dictator Ion Antonescu around 50,000 Bukovinian Jews were put in the Ghetto built in the city and later moved to concentration camps. Romanian city mayor Traian Popovici and army officers were able to save 20,000 Chernivtsi Jews. 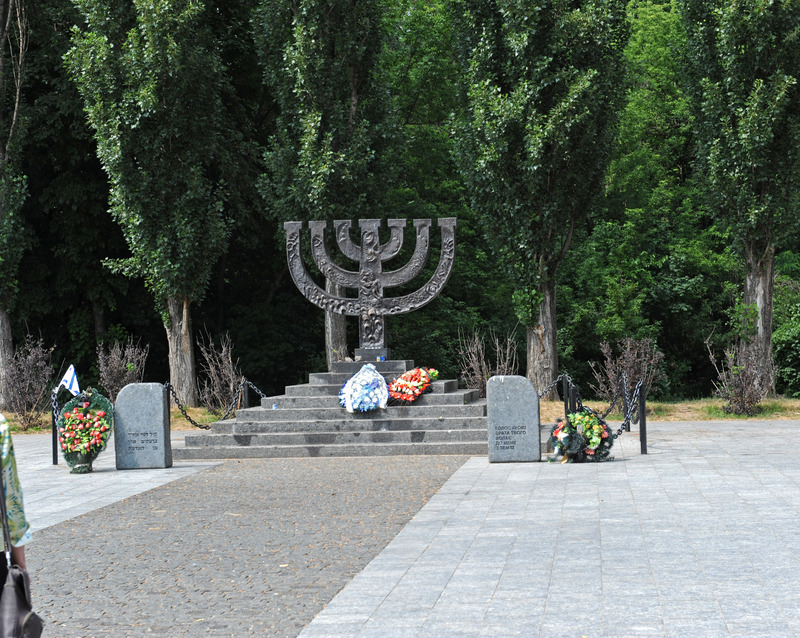 During the sightseeing, Zoya pointed at former Jewish sites which included the former Jewish House on Theatre Square, the building of the old synagogue and the hospital in Barbusse Street, orphanages, senior citizens’ houses and asylums for poor Jews, family and home synagogues,houses of Jewish communities and the educational center, commemorative token in memory of Jews, prisoners of Chernivtsi ghetto of 1941 in the Square of Turkish Well, Charity Fund ” Khesed Shushana”, We also visited Chabad synagogue and Jewish community center and museum with informative exhibits. I really recommend visiting Chernivtsi. It has multicultural feel, unlike other parts of Ukraine. It felt more Romanian/Austrian than Slavic. Plus, some other communities like Armenians, Turks, Germans left place in culture and architecture. Some of the buildings are already restored, but unfortunately many are still in bad condition. 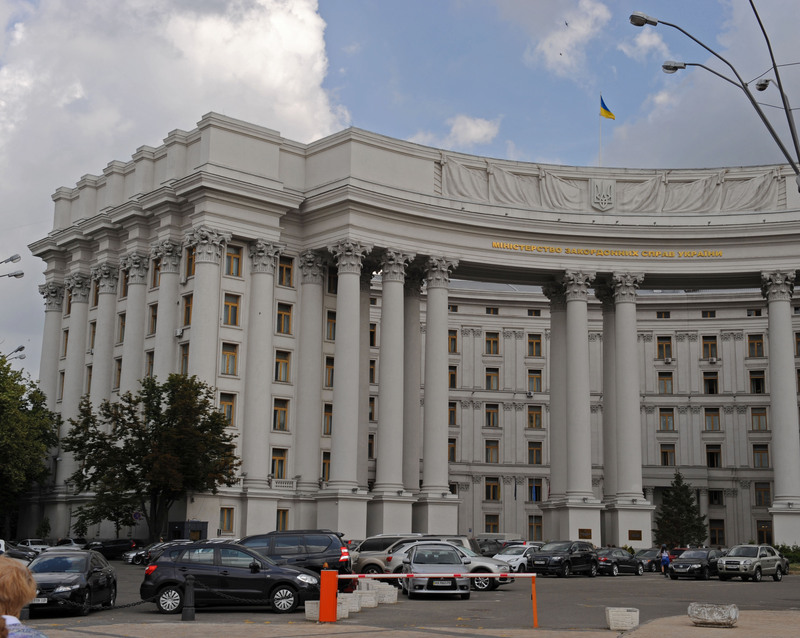 Nevertheless, the buildings are very interesting, and the history of their usage reflects the many changes in occupying countries that controlled Ukraine for many years. In the evening, we visited our new friend, Yasha, who drove us yesterday, at his summer house “dacha” outside of the city. His lovely wife prepared delicious dinner which our group enjoyed it in the garden, with bonus desert, cherries from the trees in his garden. The dinner and conversations lasted for long time and we get back to hotel tired but very satisfied with another day well spent. June 11, Chernivtsi – Kamenets Podolsky. In the morning, we checked out of hotel and went to visit Kamenets Podolsky fortress. Kamenets – Podolsky was first time mentioned in 1062. That time it was a fortress of the Kievan Rus state. The fortress was continually rebuilt and, in the 17th century, it became the strongest fortress in the Polish-Lithuanian state. In 1793, after the Second Partition of Poland, Kamenets - Podolsky became the part of the Russian Empire and the capital of Podolskaya Guberniya. Peter the Great, visited the fortress two times and was impressed by its fortifications. In 1915, Austria-Hungary army captured the city. After the October revolution of 1917, Kamenets Podolsky was a part of several short-lived Ukrainian states. After the Russian Civil War, it was joined to the Ukrainian SSR under the Soviet power. In 1941, one of the first and largest mass murders of Holocaust (about 23,600 victims) occurred near the city. The city is popular with tourists. 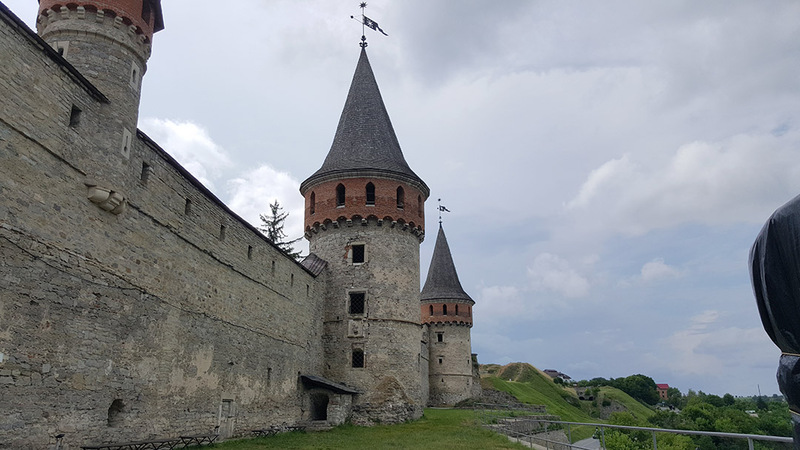 We were impressed with powerful fortifications of the “Old town”, a fortress and a fortress bridge and well-preserved historical center. We got back to Chernivtsi with stop in local superstore something like Costco where we stocked up for our night trip on the train to Kiev. From my childhood in Ukraine traveling by train, it was a tradition to buy food on the road (roasted chicken, fruits, vegetables). Tea was provided by conductor in special tea glasses with metal holders. We were all prepared for our overnight train. It is sleeper car, with 2 lower berths, soft cushioned couches. Each carriage has 2 bathrooms in beginning and the end, shared. I was concerned about the cleanliness, but our conductor was constantly cleaning it. The air conditioning only worked when the train was gaining speed, but windows can be opened. We had dinner, talked, watch scenery and settled for a night. A young woman had 3-year-old girl who stopped at our compartment to chat. I asked her what her name is. The girl said “Sophia”. I exclaimed: “I am also Sophia!”.However, the kid freaked out and started screaming: “No, No! Only one Sophia – me! No Sophia! “. Since them for few days I was called by my friends “NoSophia”. Getting off the train, we were met by our local agent Irene who brought porters. Our luggage was promptly loaded and taken separately to the bus and we walked through beautiful Main train station. It was built in 1930’s in the style of Baroque with some elements of Soviet Constructivism and now is a designated landmark of Architecture. We stopped to refresh and have breakfast in Lybid hotel and started the tour of the city. Kiev changed since my times. But it is in a different country now, it is even called now Kyiv officially, in Ukrainian language. New monuments being built. But the most famous is the old landmark, St. Sophia’s cathedral circa 11c, an outstanding example of Kievan Rus architecture. 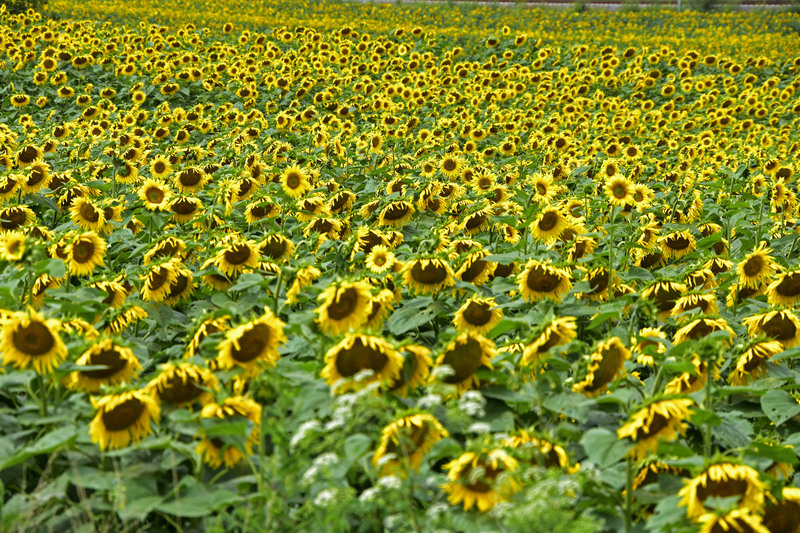 Together it is recognized by UNESCO Heritage site. 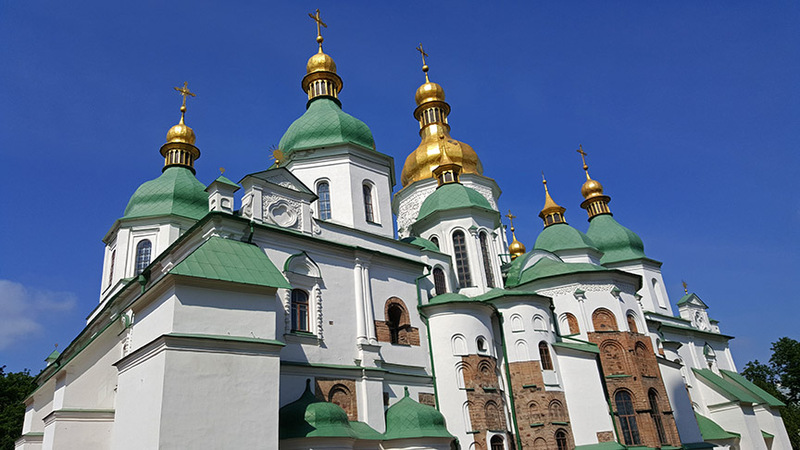 It has typical Slavic domes golden and green color and beautiful frescos inside. We spent about 1 hour there for and then left to see cities highlights. The tour continued one of the 7 hills of the city on the place where Kyiv according to some legends and documents was founded in 882 A.D- Acropolis of Slavs. We walked the most ancient Kievan street, St. Andrew’s Descent, saw St. Andrew’s Church, the masterpiece of Baroque genius Bartholomew Rastrelli, Richard the Lion Heart Castle. Kreshchtatyk, main street, was destroyed during WWII and rebuilt later in Stalinist style. We visited Independence square, “Maidan Nezhaleznosti”, the central square in the city. The buildings around it were familiar to me, but the square is new, established after Orange revolution. There is a new tall monument, celebrated independence from Soviet Union in 1991. We saw Golden Gate, an imitation of Constantinople’s Golden Gate, constructed in 11 centuries; St. Michael’s cathedral from outside, archeological site of ancient of Kiev on Desyatinna st circa 10c. 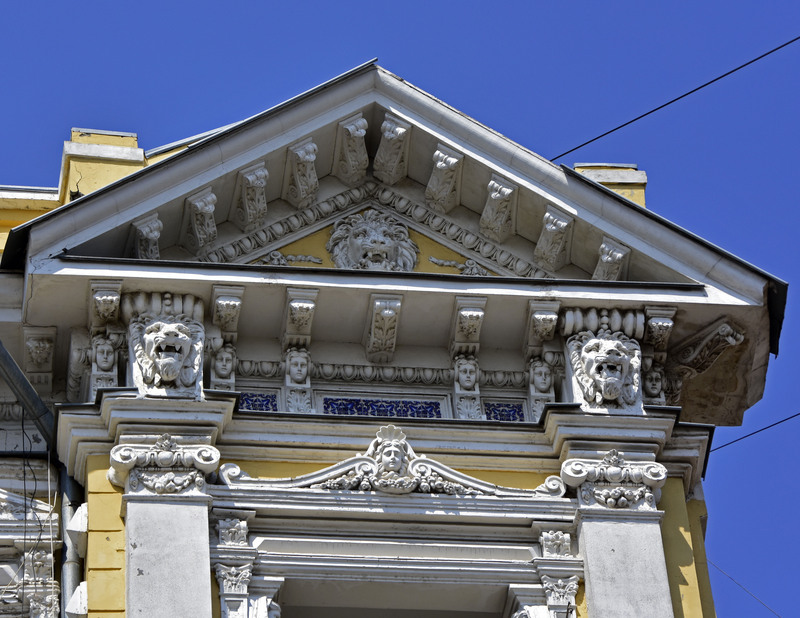 We enjoyed walking central streets with guide pointed beautiful buildings from 19c, aristocratic mansions of Lypki Pechersk district, for example, house with Chimaeras (decorations with animal figures), just across the street from President’s office. It was constructed by Polish architects Horodetsky in 1900. Fully restored now, it is a beautiful example of Art Noveau Architecture of beginning of 20c. We saw beautiful Opera house. The city is very green, hilly and has beautiful old chestnut trees. 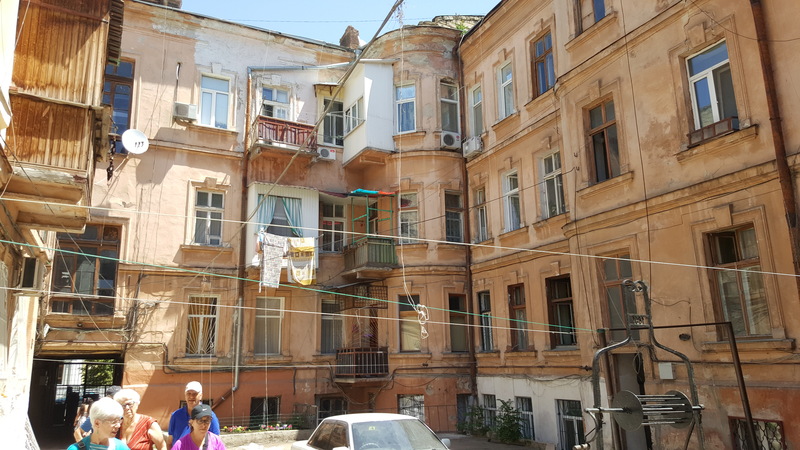 Comparing with Western Ukraine, and being the capital, the building is in much better shape and you can feel the vibe of regular European city. We went for lunch and then headed to our hotel Premier Palace for check in. It was beautiful 5* historic hotel, built in beginning of 20c, the first historic luxury hotel in Kiev. It was very nice. In afternoon, I arranged for my group to tour Podil and Chernobyl museum and Michael and myself met a friend Sasha and we set of exploring my own places down memory lane. Hata, dinner for 3 was $8 and very tasty. We went to the cemetery where I was very happy to find a grave of my grandparents. My grandmother who raised me, died in 1976. The gravestone also commemorated her husband, my grandfather whom I never knew since he was killed in Baby Yar massacre during Nazi occupation. We will visit Baby Yar tomorrow. We continued with Sasha for my quest for childhood memories and we are off to Sviatoshino, the suburb district of Kiev, where my family lived my first 10 years. Now it is a new neighborhood planned and even streets changed. 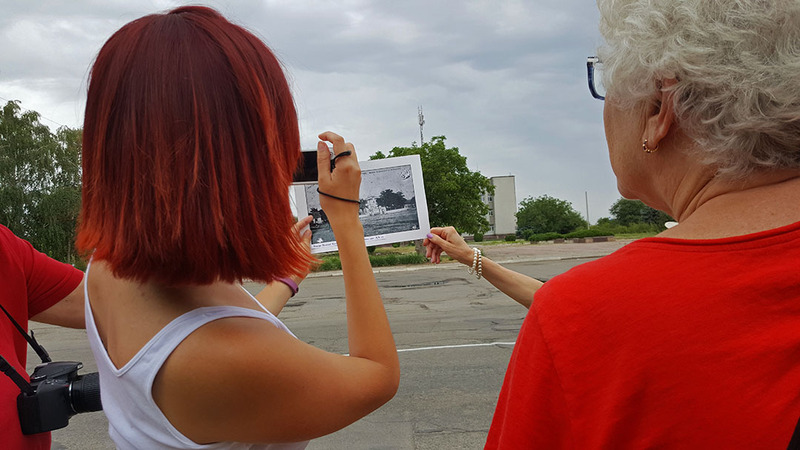 We compared old and new maps, asked local people, and found the street but of course nothing left. Still I found the school my brother went, and the area still green as it was. 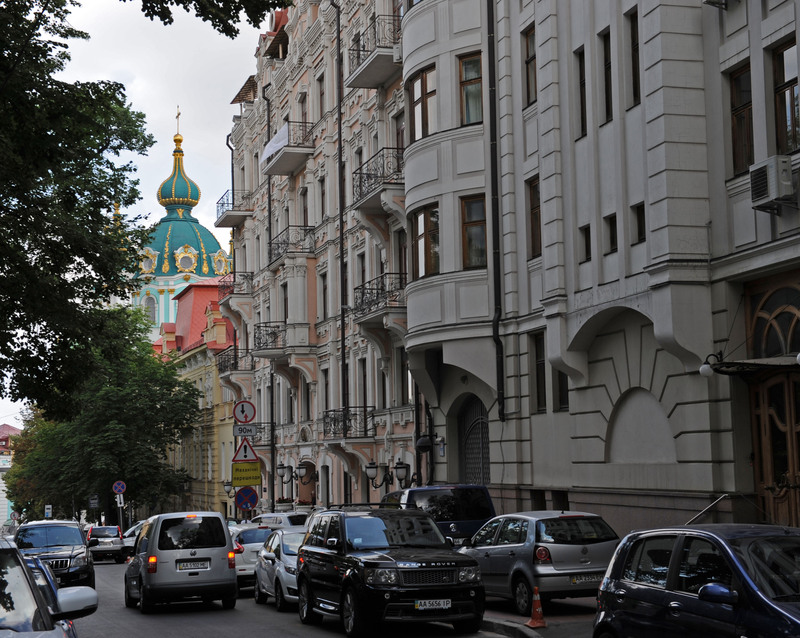 It is a bedroom community of Kiev, but since city became big, it is well connected by metro and trams to the center. Back to hotel, nostalgically happy and tired, I was ready for next day. I’ve met and checked with my group in the morning. They went to visit Pechersky Lavra Monastery, another UNESCO Heritage site and important historical landmark in Kiev. Lavra is to Orthodox Christians as Vatican to Catholics, it is most visited by tourists and pilgrims. They also visited Chernobyl museum, which marks the worst case of nuclear disaster in the world. Michael and I left with Sasha to visit my other address where I lived and spend my youth years before I moved to Odessa. It was on the left bank. My apartment building, was still there, for last 30 years it became worn out. I tried to ring the intercom for my apartment and to surprise, someone answered. I talked to the lady who lived there, and she let me in. I looked at 3 room apartment which seemed so large when I lived there but it was tiny. I thanked the lady and we left. Elevator now seemed tiny (or I am bigger??) and doors were closing fast without hesitation. In USA, you insert the hand and doors are open. Here your hand would be chopped off. The chess club on the first floor where I played chess, now is s wedding chapel. Somewhat tacky and has tall tower now which blocks people balconies and view. We went to another address few blocks away to check building of my relatives. People were friendly whenever we’ve met and willing to talk. We went to Sasha’s for lunch and enjoyed delicious Ukrainian specialties his lovely wife and beautiful daughters prepared. We stopped at the memorial to Stalin repression victims in 1933-1940 Bykovnanski Graves neighborhood on the site where executions took place. We returned to Kiev center to join my group for lunch at Brodsky synagogue. 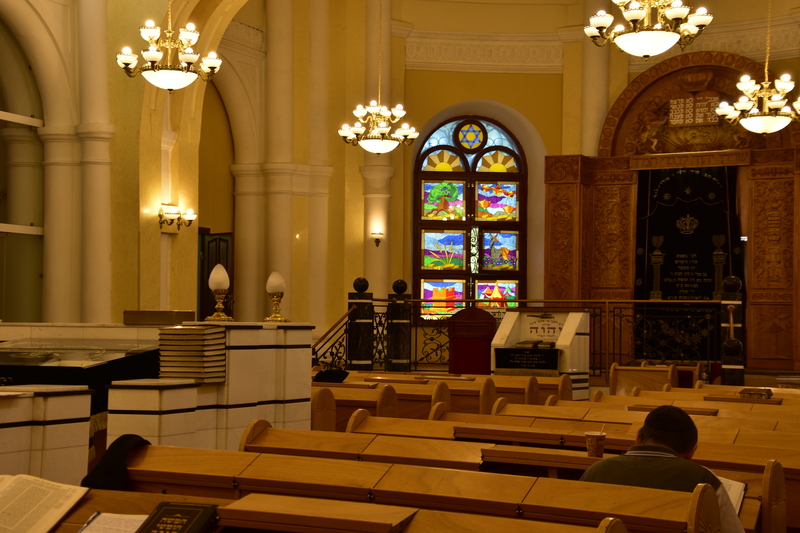 It is the largest synagogue in Kiev, built in 1898 in classical Romanesque style. We had lunch there and talked to the synagogue members. My niece is working there at Chabad, so we met and agreed for dinner tonight. After lunch and synagogue visit, we left for Baby Yar memorial site that is known to humanity as the scene of one of the bloodiest crimes committed by fascism in September 1941. Gypsies. Children’s monument I found incredibly moving. My grandfather was also killed here. We said a kaddish at the memorial and where grateful when nearby visiting Canadian official delegation who had rabbi with them, joined us and rabbi chanted properly. I forgot to ask their name. It was another emotional but successful day. In the evening, we joined my niece Galit, her husband Itzik and their six-year-old son Dov for dinner at kosher restaurant Mendis by Brodsky synagogue.This is a remarkable enthusiastic young couple. Both raised by non-religious parents and became volunteers and now work for Chabad. Itzik worked on various projects, like Chabad kosher fast food truck. Currently they are involved in a project Anatevka. There is a village not far from Kiev, Ignativka. It was a prototype for Sholom Aleichem for his Tevie the Milkman stories, known in USA by popular film and show, Fiddler on The Roof. The village names in the story is Anatevka. But it was Ignativka. 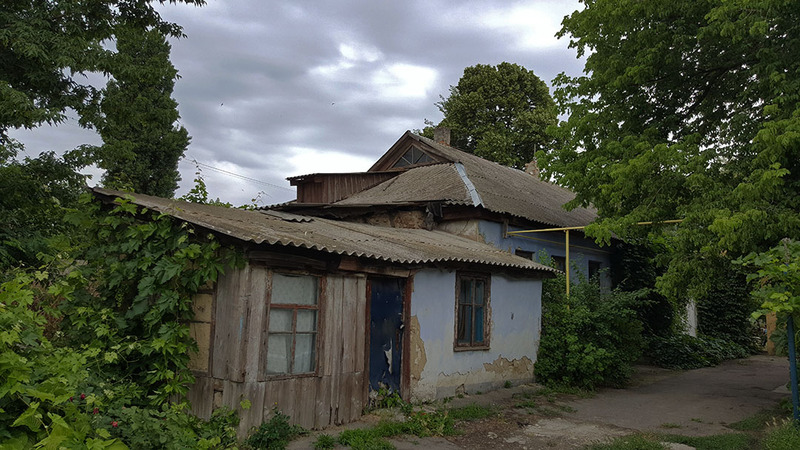 One of the rabbis bought a property 3 years ago when the fighting started in the east between Russian separatists and Ukrainian army, to accommodate fleeing Jewish refugees. There was Jewish community built with synagogue, mikvehs, a cheder (school for children). They called this community Anatevka. Some refugees stayed, some moved on, however idea of a shtetl caught on. Now it is living community. There is hotel is being built so very soon, travelers can spend time in Jewish community in Shtetl Anatevka! Residents also are building their own apartment buildings, in bucolic countryside. 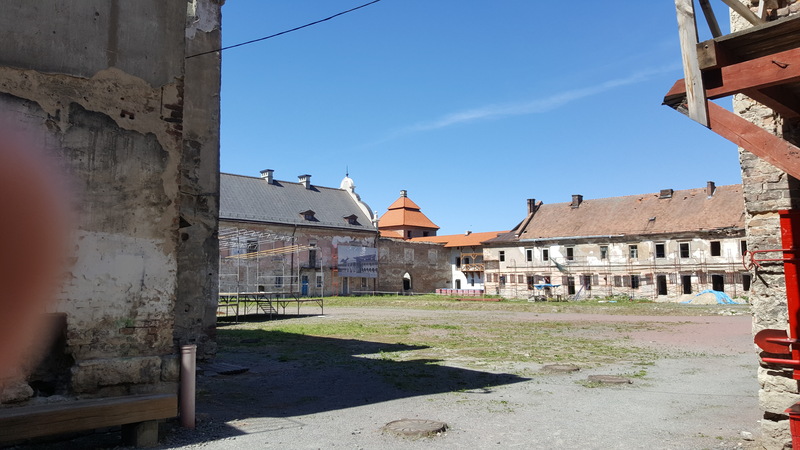 This was very uplifting for us to know that Jewish life returned to Ukraine and even Sholom Aleichem’s village is now a reality, but under much better conditions than years ago. We sat for dinner at Kosher restaurant Mendis and marveled how Jewish life blossomed in Kiev. When I was living there, we could not go to synagogue, only old people who had nothing to lose, were going there. During Passover, my grandmother was delegated to go there and buy matzoh since other family members can lose job or have problems in school or college. Now there are many religious families, practicing religion openly. I asked about antisemitism and Itzik said that there are always antisemitic people, but Jewish community is strong, and they are not afraid to walk around looking like religious Jews. We walked to our hotel together afterwards and indeed no one seemed to bother us. This would not be possible in the Soviet Union. So at least Ukraine government does something right and does not tolerate antisemitism. After breakfast, my group checked out and we went to airport for our flight to Odessa. It was first experience with Air Ukraine and they charged us for not getting our own boarding passes online. After fruitless conversation, arguing that their website was malfunctioning, and we could not complete it, and we paid 15 euros each for boarding passes. This was ridiculous. The flight was fast and in 1 hour we arrived Odessa, another city dear to my heart. I was born in Kiev, but my husband was from Odessa. After marriage, I moved to Odessa so last six years before we emigrated, I lived in Odessa. I fell in love, married and had my son there. Our guide Natalia met us at airport at 10am and we started our tour from airport. The new terminal just has been completed so for next visitors, you might just enjoy it. We visited Holocaust Memorial on the way to the city center reminding us about Odessa occupation by Romanian fascists. We continued to the city, and visited wonderful Jewish Museum, located in one of the characteristic courtyards of Odessa, in the building where communal apartments are. You can her all smells of what neighbors are cooking. It is interesting museum with only 4 rooms housed in typical Old Odessa apartment. The Museum curator was very animated and enthusiastic. He gave presentation in English translated by our guide.It gives you a good picture of Jewish life in Odessa since Jews were 44% of Odessa population before the war and in 1900 Odessa was 3rd largest city with Jewish population in the world (after New York and Warsaw). During this period the city served as a home to numerous Jewish writers and poets including Mendele Moicher Sforim, C.- N. Bialik, Sholem Aleichem and S. Chernikhovsky. I observed new monuments added since independence of Ukraine. I noted and sat on the bench of Leonid Utesov, the great musician and performer, founder of Soviet Jazz. There is very popular Soviet movie set in Odessa of 1920, Twelve Chairs. Now there is a monument – chair in the City Garden. The house where famous writer Isaac Babel lived, had painted frescos in Odessa’s scene in the courtyard. And Odessa Cats still run the city! We walked beautiful Passage building which has indoor stores arcade. t was good to be back and to be back in style I though, when we checked into Hotel Londonskaya, Historic circa 19c hotel. When we lived in Odessa, we could not visit it since it was only for foreign tourists. Now I am one of them, but it is also open for locals. The hotel is Grand and has great potential but unfortunately it is very tired. Some rooms malfunctioned, and elevator button did not work on 3rd floor, ducktaped. We were upgraded to suites, each room in hotel named by one famous person who stayed there. I wish they restore it to the former glory. Location was excellent, and our room faced Primorsky boulevard, and I enjoyed the view of the sea and Boulevard action. I recalled when I pushed carriage of my son there and was much younger. 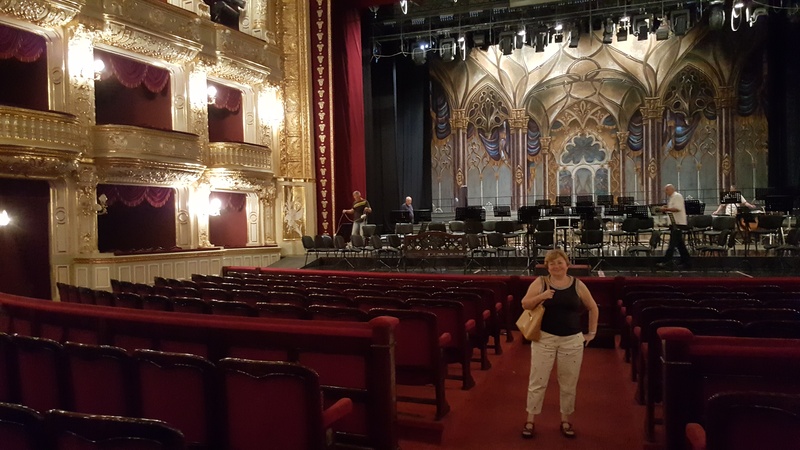 After rest, we gathered again and walked around the corner to the Opera Theater with our guide where we were given a tour. 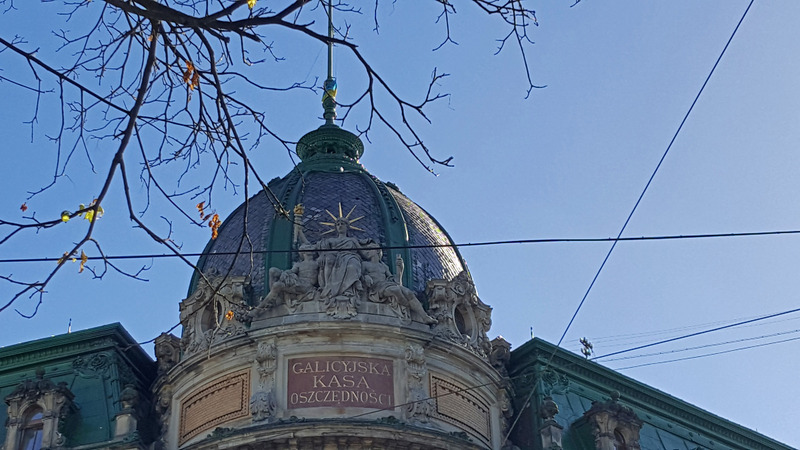 The theater was opened in 1877 and built by the same Viennese Architects Fellner and Helmer, who built same theater in Vienna, and Lviv buildings (see above). It has Baroque and Rococo style. We had interesting tour of the theater, and since it was opened only for us, we had great opportunity to take nice pictures. I took a mental note to buy tickets and attend performance. We walked back to hotel and rested. Later, we strolled Palais Royal by the opera where I also visited the former courtyard where my husband spent his childhood. Odessa is the city of humor. You can hear and see humorous undertones all the time. I laughed when across from Hotel Mozart near Opera theater, someone opened café Salieri. We ended up eating at Salieri. My friends and I enjoyed light dinner there in the courtyard.We had desert and appetizers. For appetizers, we had forshmak. I know, funny name, but in Odessa and Ukraine it is chopped herring, with hard boiled egg, apple, onion. There are many variations of it, but this was first forshmak I tried in Odessa and gave it A. We walked back to hotel and strolled boulevard in the evening, next to hotel there is monument of Armand-Emmanuel de Vignerot du Plessis, Duc de Richelieu or affectionately called just Duke, on the top of Potamkin staircase facing the sea. He is a beloved figure of Odessits - Descendant of Cardinal de Richelieu because of the French Revolution had to immigrate to Russia and was appointed governor-general of Odessa. Even though he was the mayor of Odessa only in 1803 (9 years after its creation), his contemporaries regarded him as one of the founders of the city. After 11 years of running the city, he went back to France and became a Prime Minister of France. After 6 years, he resigned, and was about to return to Odessa to live the last years of his life in their "new home". But a few months after retirement, at the age of 56 years, Armand Emmanuel de Richelieu died of a stroke. 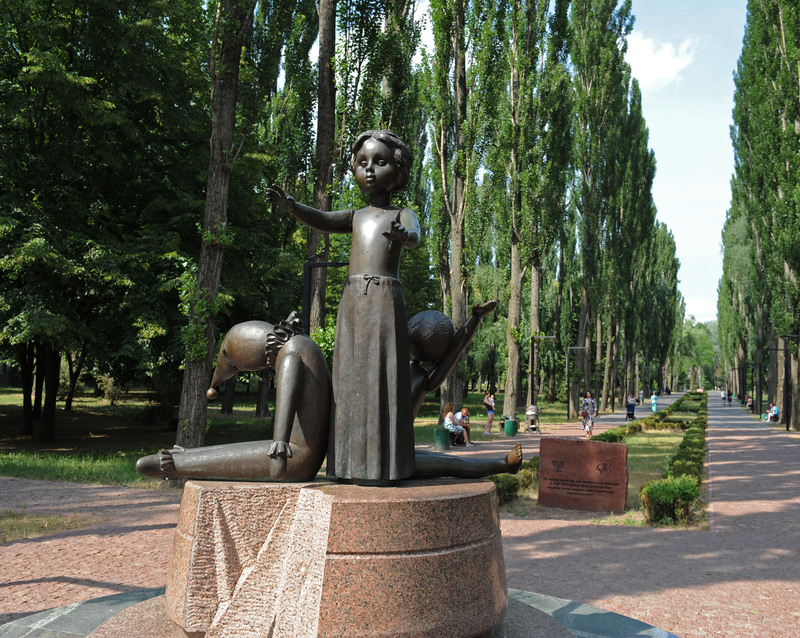 He is beloved by Odessits and the monument is the popular meeting place for locals. I remember when I had dates there as well. And there are certain points to see the monument from different angle… But I will show it to you if you come to Odessa with me next time! We hung out by the Duke, walked and took a funicular down and up Potamkin stairs, listened to street musicians. We especially liked one violin player. After breakfast we continued tour of Odessa. 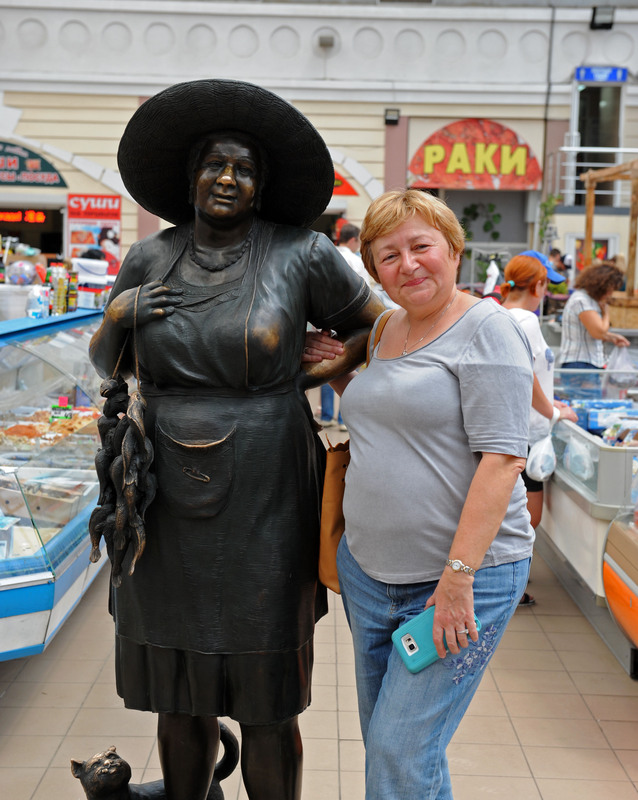 We visited Privoz, the famous huge market of Odessa. It has goods but the focus we went was to sample food. That’s where you see all Odessa specialty fish, produce from all part of Ukraine, fruits from Asia, Georgia and Armenia, milk products. The group enjoyed it. I was worried about pickpockets and had to watch everyone, but it turned out without casualties. After Privoz, we went to somber holocaust museum which shows the horrors of Nazi occupation during WWII. In this case, Odessa was occupied by Romanians and became part of Transnistria. But atrocities were the same. The main task of the Museum is to collect, preserve and convey to future generations the story of this unprecedented tragedy; to preserve the memory of those who suffered; and educate a new generation of young people who will be able to confront fascism in the twenty-first century.We've met Holocaust survivors who came on the meeting to the museum. 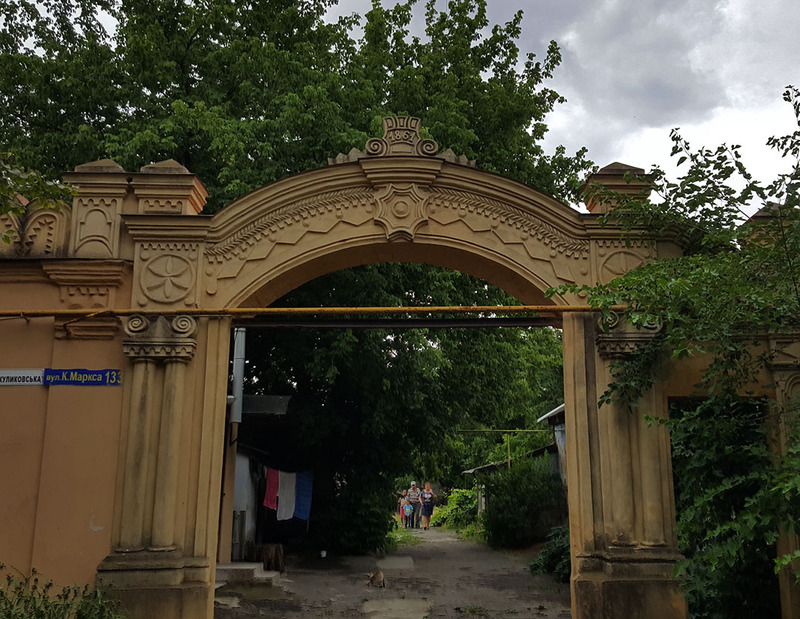 We went to see Brodsky synagogue, built by a Jewish family from Brody in 1893 and then continued to Catacombs - The only Ukrainian underground museum was established on the site of the oldest in the Odessa region catacombs. The museum is a monument of the partisan movement in the Odessa region and to the men of the squad of the hero of the Soviet Union Vladimir Molodtsov - Badaev. 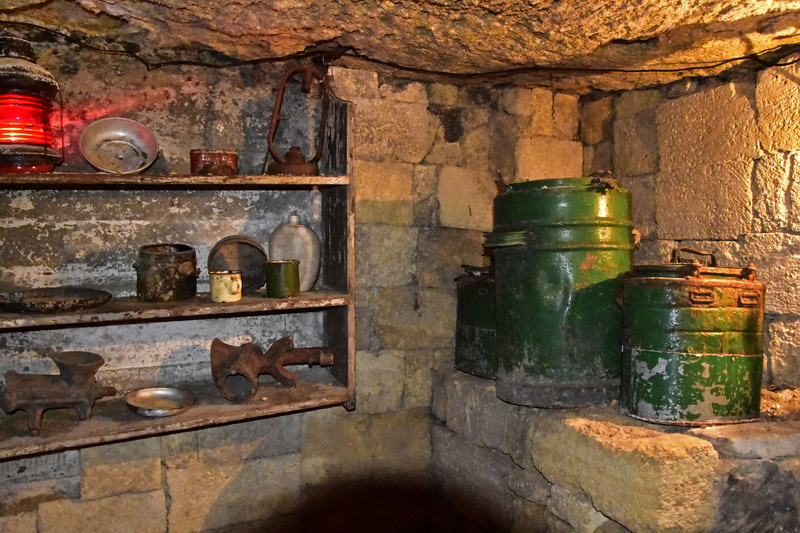 During the year 70 people lived in Nerubayske catacombs were active in sabotage and intelligence activities were walled by Romanian invaders andwere almost killed. Catacombs is another unique feature of Odessa, since underneath the city there are about 2500 km of caves carved from limestone. In the labyrinth of catacombs, since foundation, the rebels, criminals and smugglers often found refuge. Due to the safety, only one small portion of catacombs is open to public as partisan museum, and you need always go with the guide. The temperature there is quite cold, so wear warmer clothes. After we emerged to the light from catacombs, we were ready for food and last night dinner was in the Odessa’s best restaurant Budapest where chef created for us special Odessa Menu. It was excellent. Probably most expensive restaurant in Odessa but worth it. After dinner we went back to the boulevard listening to our favorite violin player and watching people by Duke, boulevard and Potamkin stairs. In the morning, we said good bye to my group who were returning home. The four of us left for our next adventure – to Kahovka, on heritage quest. We’ve done heritage research on their family who emigrated to USA and Canada from Kahovka in 1920. We contacted archivists, but it took few years before we were able to come and visit. I knew about Kahovka but never visited it. It was very important Jewish city before revolution. Kahovka is not a touristy city. it took a bit to research and find local people who would show us around and look at the places we were interested. 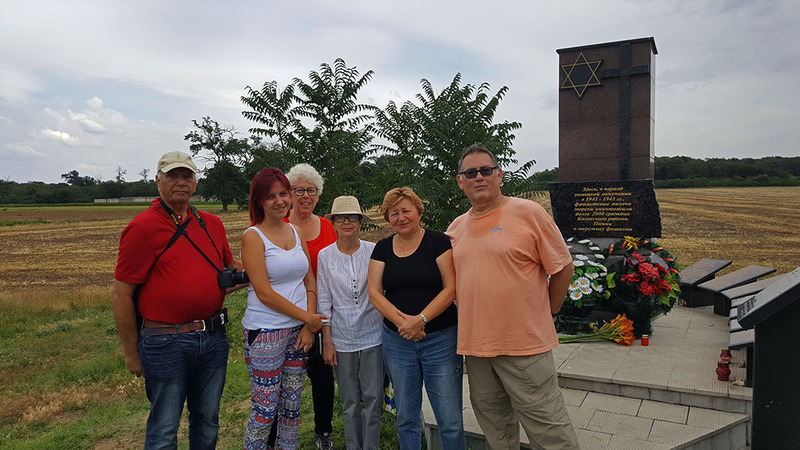 Local agency in Odessa supplied a driver, transportation and enthusiastic local guide Alena who knows a lot about local Jewish history. However, they admitted, they never did tour to Kahovka but would be willing to explore and learn about it in the process. 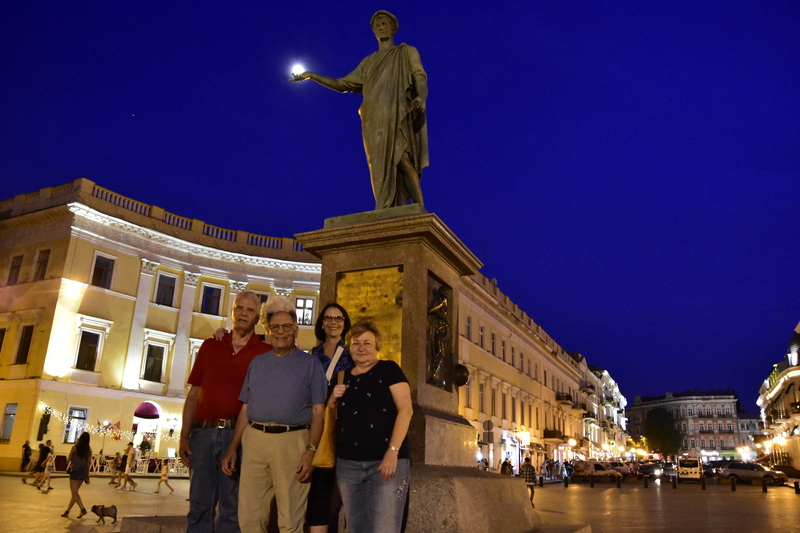 We set off from Odessa for 1 night/2 days trip of heritage quest with Alena and driver Ruslan. We drove on the Black Sea coast, and passed Odessa South Port (Yuszny), which had some beaches. Then the road continued to Nikolaev where sea view scenery changed to flat steppes. At highway's gas station besides bathroom stop and filling gas, we discovered very good highway stop food. We enjoyed hot dogs (introduced to us by Alena), excellent coffee and on other stop I even tried blackcurrant tea from fresh ground currants with sugar. 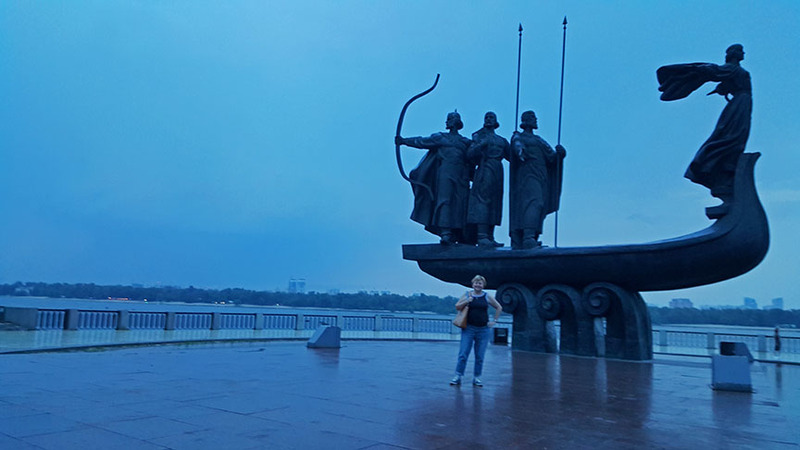 It is not possible to get to Kahovka in one day, so we planned to overnight in Kherson which also has rich Jewish heritage and meet with local historian there. Or arrival Kherson, we stopped for lunch at local nice restaurant Nostalgia with decent food, in nice setting on the terrace. We met guide Sergei who took us around the town to see all traces and current Jewish sites. Kherson was founded in 1778 by Count Potemkin, on orders of his lover, Catherine the Great. Kherson was to be a base for Russia's Black Sea Fleet. Jews were once of the first to settle and in 50 years it was a big center with Jewish institutions. The population diminished during pogroms and Russian civil war in 1919. Also, many people died from famine. Then Nazis occupation and Holocaust. 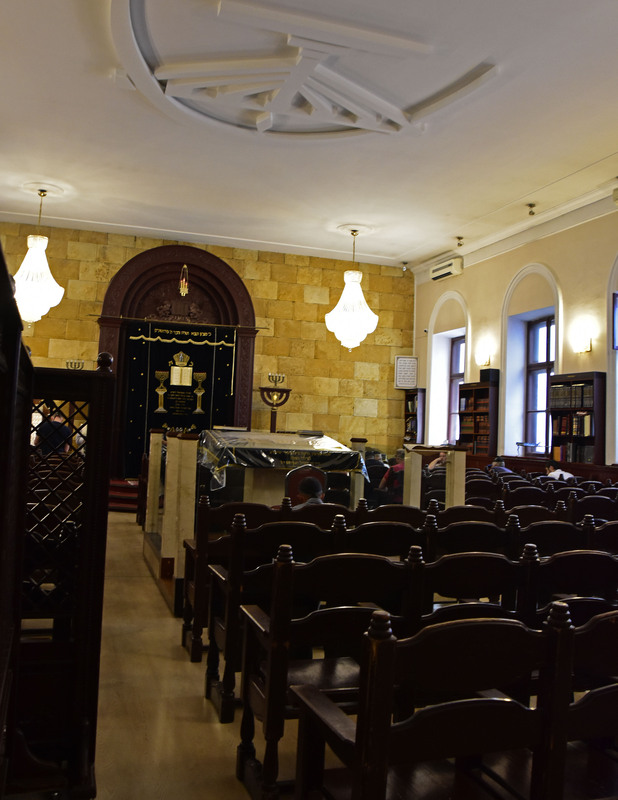 We visited impressive Chabad synagogue built from 1895, which was destroyed during occupation and restored in 1947. Since 1993 it is run by Chabad, was renovated in 2010. Before the war, 25% of population was Jewish. Now there is still sizable Jewish community. Together with local historian Sergei and Alena,, we saw building which remnants of former glory were and learned about traces of Jews left in this city. After tour, we went to our hotel. So far, the only acceptable hotel there is Swiss chain 3* Reinkartz. To our surprise, it was very well run, with good air conditioning and comfortable functional rooms. We also found nearby unexpectedly good Georgian restaurant and had an excellent Chachapuri (Georgian Pizza) and Chicken Tabaka. Next morning, after breakfast, we left Kherson and continued for Kahovka. On arrival, we’ve met local lady Svetlana who is a director of History museum and knows a lot about city including Jewish history. We sent her some addresses to check out, so she planned our itinerary. We walked the streets where our friend’s family lived. 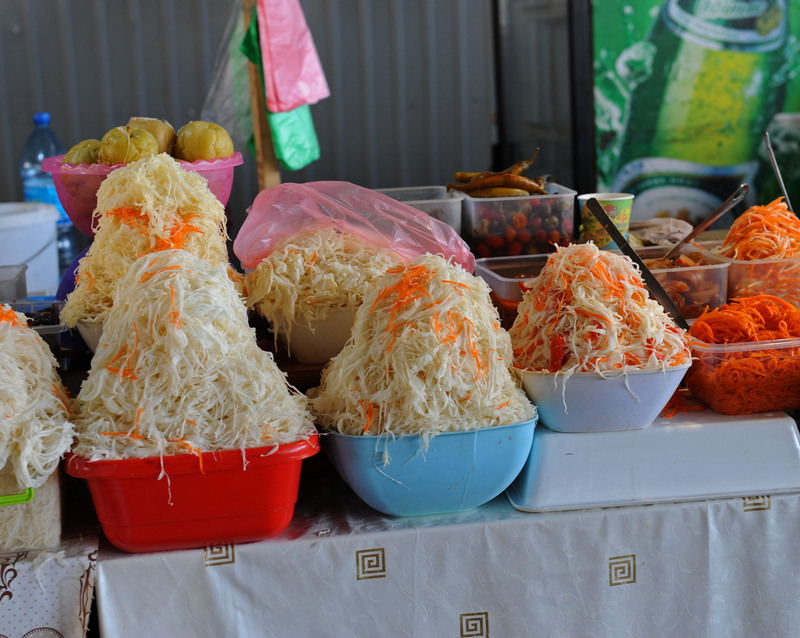 One was a place where merchants traveled to Kahovka fairs. Something like caravan serai. There are still beautiful arches on connecting buildings. Local people who lived there, talked to us on whatever was in these buildings/courtyards. We went on Post and Russian streets. It was a Jewish quarter. We ended at the market square which is still a market now. We even noticed some local people following us, first it made me uncomfortable, but we were explained that they never seen American tourists before. We finished at Terny memorial site where Nazis killed Jewish and Christian citizens of Kahovka. Sad event. Svetlana brought flowers on the site to commemorate murdered people. Local movie producer joined us at memorial site. He produced a documentary of Kahovka (in Russian) and interviewed our friend. Below is the link of us at Terny Holocaust Memorial. Afterwards, we had a nice lunch in the restaurant facing river and left for Odessa. It took 5 hours stop and few more hotdogs, coffee, before we came back to Odessa. We had 5 more nights without any agenda for Odessa. I was looking forward to rest and explore. I went to visit house where I lived. While I was able to get into courtyard, however, no one opened the door of the apartment intercom. I took photos from outside and we went for a walk around the street. Near was New Bazaar. Not as large as Privoz, but we still enjoyed to sample food there and bought some necessities. The Cathedral Square where we spent in my youth a lot’s time and with my child playing in the park, now has built a Cathedral. You wonder why it was not there? The Cathedral was blown up by Soviets after Revolution. The new one was built up after independence. I’ve met friends from my time living in Odessa, Misha and Olga, who are historians and preservationists of the City. Olga is an attorney and worked as a guide. They were wealth of information. 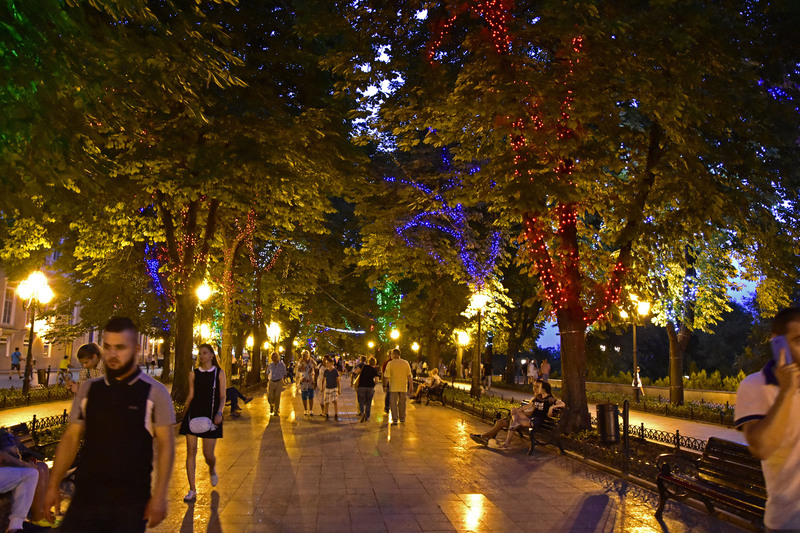 We had nice walk and explored corners of Odessa which tourists do not see. Very nice area of Odessa in “Mother in Law Bridge”, old corners of Odessa. There was a monument to oranges. After Katherine the I, Emperor Pawel I ruled the city and cut some funds. The people of Odessa sent oranges as a gift to the king to St. Petersburg in 18c. As a result, The Emperor gave money for completion of the port which helped Odessa. So unofficially, this is a monument to the first bribe! At mother in law bridge (legend says during Soviet times, the Party official built it to go to his mother in law for lunch, so it cut short travel time), I had visited my old favorite corners and even recreated a photo of my youth. There was famous Jewish Satirical write Mikhail Zhvanetsky, who is one of the beloved sons of Odessa. Now he lives in Moscow, Russia but still visits Odessa and there is now Boulevard called by his name. We had lunch at characteristic restaurant Dacha. It is one of the projects of Odessa’s restaurateurs Saveliy Libkin. Located on French Boulevard, in setting of Odessa’s summer residence called Dacha, and nicely decorated by nostalgic 1970-1980 times. Food is excellent Odessa style. It was excellent. We also walked the city and admired beautiful buildings. Guys had haircut at hair salon recommended by Misha at very good price. In the evening, we attended ballet at Opera Theater. One day we took a boat ride on the sea from port. One day I visited by myself the literary museum which I donated manuscripts of my late brother in law, who was Odessa writer/humorist and got a private tour from museum director. During the day, we walked, shopped, took nap and when we had nothing to do, we just sat on the bench outside of Londonskaya at Primorsky Boulevard. For a week we became part of it. We got acquainted with local pigeon people who would ask tourist to pet pigeon. We started knowing boulevard dogs and their owners, souvenir vendors, children and had preference for different musicians. We tried all Odessa food – small fish cooked in all imaginable forms, eggplant caviar, borscht, varenikes, gefilte fish. We visited more than once another restaurant of Saveliy Libkin, café Kompot. The theme is compot – cooked fruit drink. The café had good food and excellent desert. I was reminiscing on my return that finally I am back. Living at Londonskaya hotel, 30 years ago I would not be able even cross the door, it was only for foreigners. Now coming back in style, still I felt like outsider but still the city was close to my heart and I enjoyed coming back. I changed, and city changed but still I loved being there. Two more Schleppers arrived for 4 nights in Odessa, and we had fun time exploring it together. I arranged 2 days of sightseeing for them and the rest we did together. 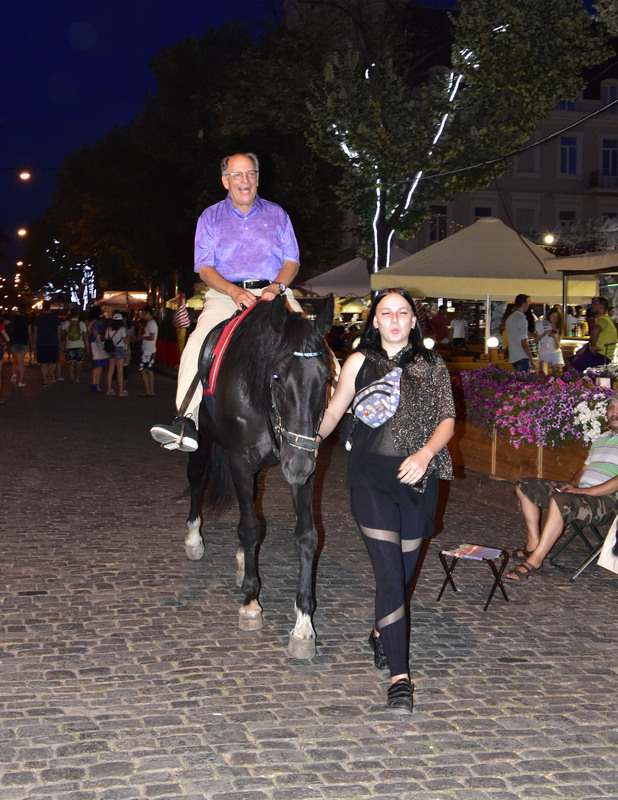 Evenings we also visited Deribasovksaya – main street where various activities going in the evening including horse rides. Not my kind of things, but some of us “ride into sunset” on a horse. That concluded successful Schleppers trip to Ukraine which was part of 3 tours, together with Poland and Romania. Ukraine was special for me because I was born there, and it was my first returning trip. When I lived there, it was another country and Soviet Union did not treat us well. When we left, we swore that we never go back. When Ukraine became independent country, I was still apprehensive to go. Then for 3 years when the war started with Russia, it was off limits. Now it was a right to come back and check it out. I am happy to report that I was glad I went back. Ukraine is different country now, with new generation of optimism, and hope for peaceful feature. People are nice, Jewish life is undergoing Renaissance, and in addition to beautiful scenery, great European cities and excellent quality inexpensive food, it is a good time to visit. I loved what I saw. When leaving from Odessa airport, I gave my passport to passport control person. I was a bit apprehensive leaving border of Ukraine again, because 30 years ago they gave us hard time and tried to separate my family. The passport control officer took my American passport and asked on which passport I came in. My birth country shows Ukraine. I said, it is the only one passport I have. She asked if I was born here. I said, “I was born in the country which does not exist anymore – Soviet Union and I am back first time”. She asked: “How do you like it?”. I said: “I liked it very much”. She smiled and wished me a good trip. I want to come back and spend more time maybe settle for a month in Ukraine to explore better and hopefully bring more clients and host them there. That concluded my group trip to Ukraine. 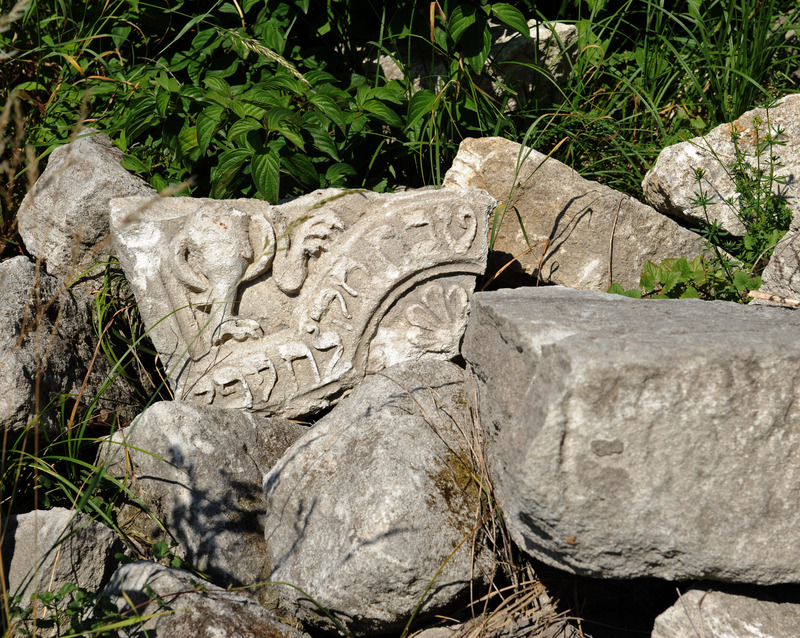 Interested in Jewish Heritage Customized Itineraries?